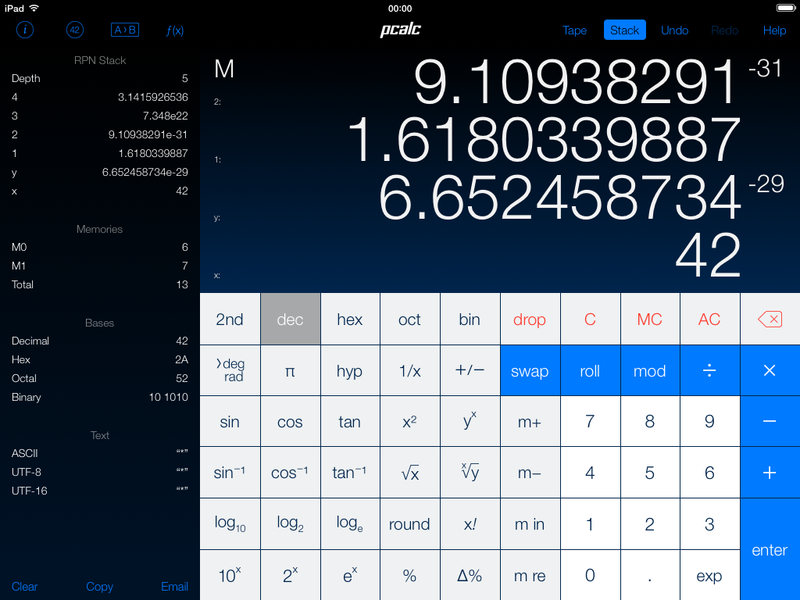 PCalc is ideal for scientists, engineers, students, programmers, or indeed anybody looking for a feature-rich calculator for the iPad, iPhone, or Apple Watch. 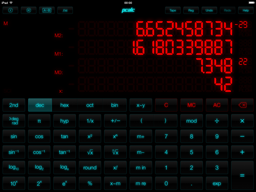 It includes an extensive set of unit conversions, a paper tape, an optional RPN mode, engineering and scientific notation, as well as support for hexadecimal, octal and binary calculations. 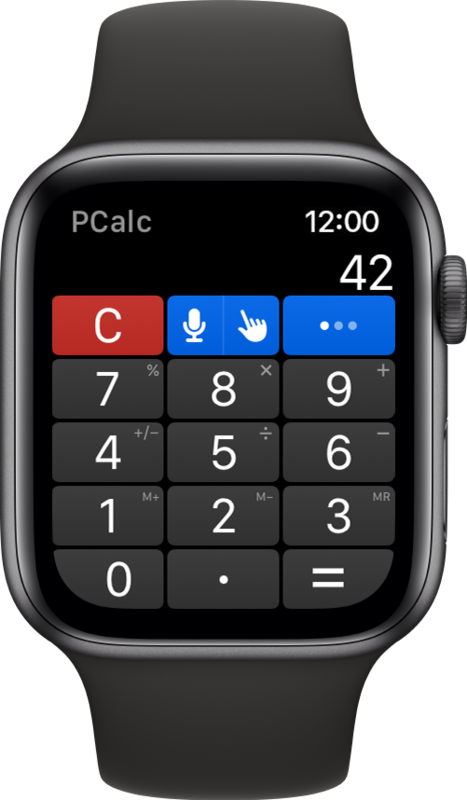 Based on the popular calculator for the Macintosh, PCalc has been redesigned from the ground up to give the best handheld experience. Switchable button layouts - choose from many different horizontal and vertical layouts to suit your needs. Plus a full editor, so you can create your own and share them with others. Apple Watch support - a full calculator on your wrist, with support for RPN. 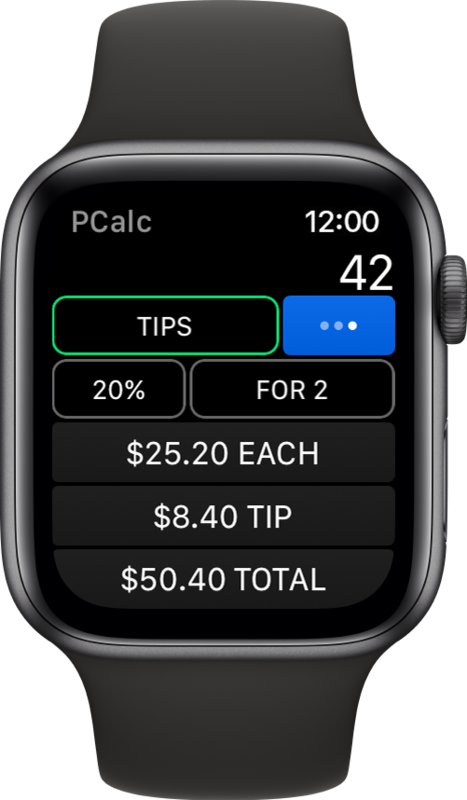 Also includes a tip calculator. Support for splitscreen multitasking, both in slide-over mode and full split view. 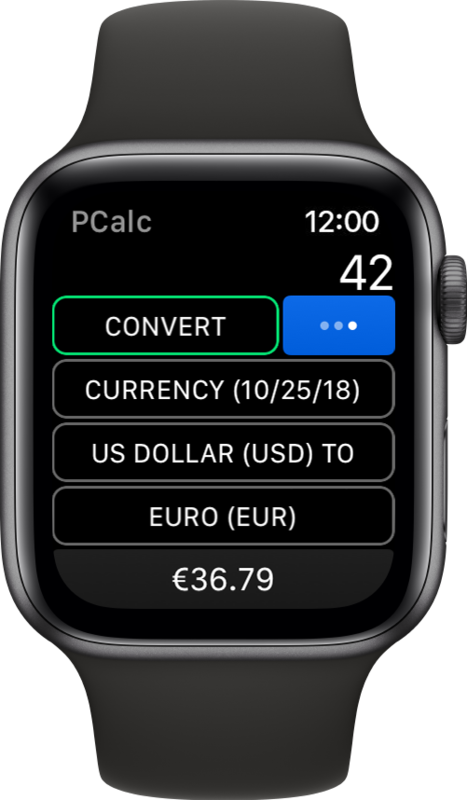 Full support for scripting with Siri Shortcuts, including performing any PCalc action in the background. 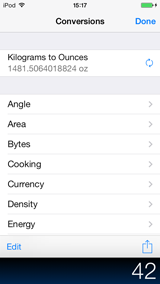 A Notification Center widget for quick access - tap the display to switch to the main app, mid-calculation. 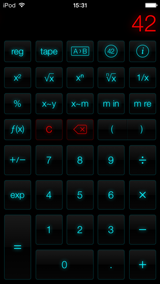 Calculator themes - pick your look, all the way from minimalist to striking. An optional RPN mode with one button access to the stack and optional multiple-line display. 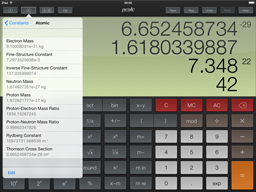 Editable unit conversions, functions, and constants which are synced automatically across multiple devices. Hexadecimal, octal and binary modes, complete with a variety of bitwise operators. A simulated paper tape to keep track of your calculations with a "ticker tape" mode under the display. Multiple undo and redo. Just flick the LCD to the right and left to reveal the past and future. Universal build supports both iPhone, iPad, and Apple Watch in one. 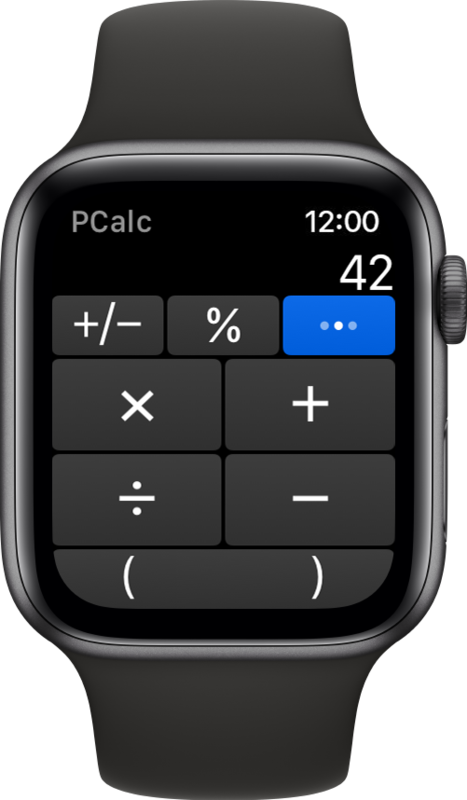 Handoff of in-progress calculations between PCalc on iOS, watchOS, and macOS. 3D Touch support, including fully customizable icon menu shortcuts. Full support for iOS 12 and iPhone XS Max / Apple Watch 4. 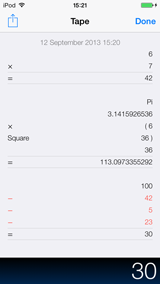 Even a (pretty silly) AR calculator mode! Click on any of the images to see a bigger version. You can see lots more screenshots here. It costs $9.99 in the US, price varies in other countries. 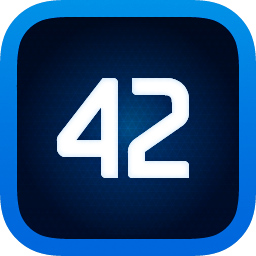 PCalc is a universal app - one purchase will work on iPad, iPhone, and Apple Watch. 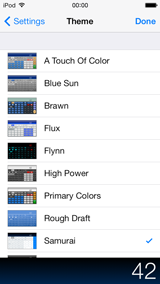 PCalc requires iOS 9 or later. The Apple Watch app requires watchOS 2 or later. 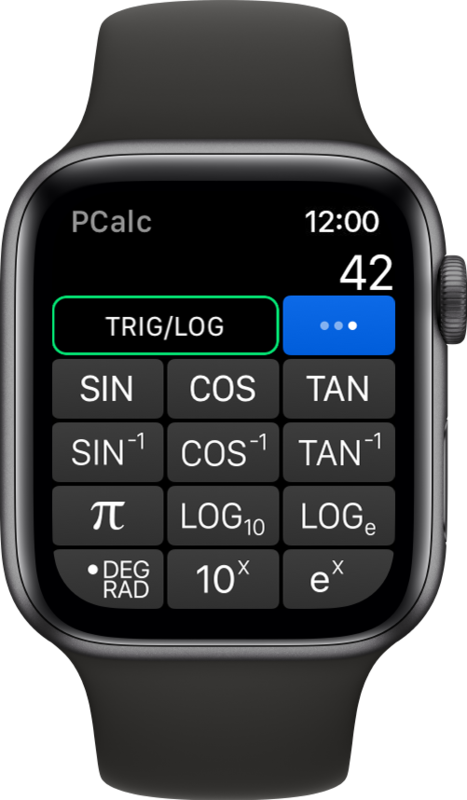 PCalc Lite is a fully functional and free taste of our popular scientific calculator for the iPhone, iPad, and Apple Watch. 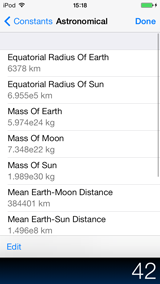 You can download it from the App Store here. 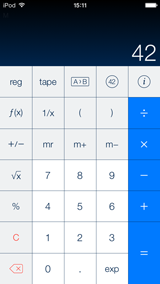 In the continuing absence of demos or trial periods in the App Store, the idea behind PCalc Lite is to provide something useful and free that's better than the Apple calculator, but which will also drive interest in the full version. 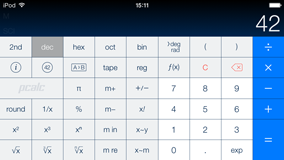 PCalc Lite is a great calculator, but PCalc is even better! 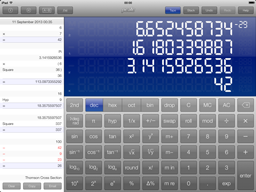 "...a solid, stable and feature-rich app, this Mac veteran can still cut it in the world of OS X...."
"...whether you’re performing serious scientific calculations, doing high-school physics homework, or just converting everyday measures, PCalc has the features and interface for you..."
"…the best professional-grade iPhone calculator…"
"…what’s perhaps most impressive about PCalc is that TLA Systems has managed to squeeze so much functionality into the program without making it unwieldy; rather, it’s positively fun to use…"
"…PCalc is the app for those of us that need pure power when computing on the iPhone…"
"…best calculator for power users…"
because it’s a calculator that does more than the sum of the parts..."
"...for me, buying PCalc was a no-brainer. And I didn’t even need a calculator to figure that out..."
"...I like it very much!" 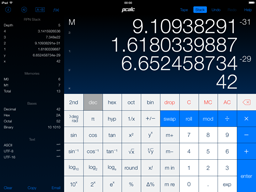 "...while I’ve seen a few iPhone apps that are really good, PCalc is the best so far..."
"...transforms your iPhone or iPod touch into the coolest scientific calculator ever...."